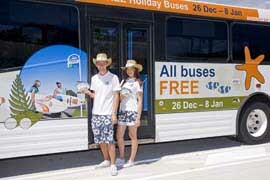 From 26 December 2012 to 6 January 2013 Sunshine Coast Council, in partnership with TransLink, are again providing FREE public transport for everyone on the Sunshine Coast. • TransLink’s Sunshine Coast Sunbus services (27 routes). • Glasshouse Country Coaches services (Hinterland Connect and Maleny-Landsborough-Beerwah). • Flexilink services (Boreen Point to Tewantin, Conondale to Witta to Maleny, Kenilworth to Mapleton and Peachester to Beerwah). Note: normal booking procedures apply to Council Cabs and Flexilink services. 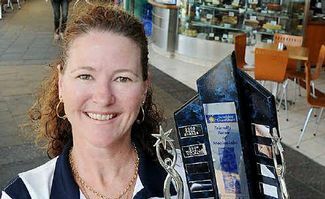 The winners of the 2012 Mooloolaba Customer Service Awards will be announced at Annual Service Awards event, on Tuesday 11th December, at See Function Centre, The Wharf, Mooloolaba. The Mooloolaba Customer Service Awards were initiated by Mooloolaba Business & Tourism to celebrate and acknowledge the great job that customer service staff do in Mooloolaba, and this is the fifth year that the Awards have been running. Last year, over 250 nominations were received for people in the four different categories, with 52 different Customer Service individuals vying for the top honour. 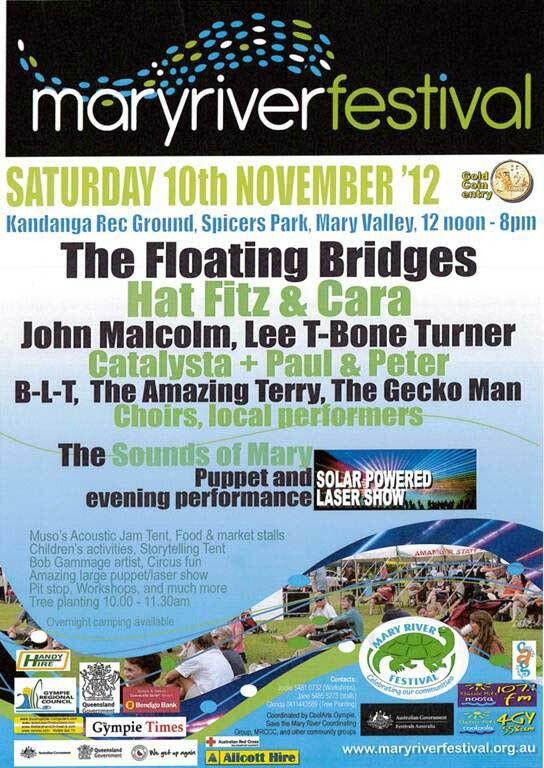 Annual environmental festival celebrating the communities along the Mary River. Bringing the Mary River communities together to celebrate the wealth and abundance that the river brings to our region through drama, music, art, fun, education, environmental discussions and displays. Patron feedback from last year’s event invariably described it as “the friendliest festival you’ll find”, “a truly magical day” and “something very special” and the organisers are planning something even more special this year. 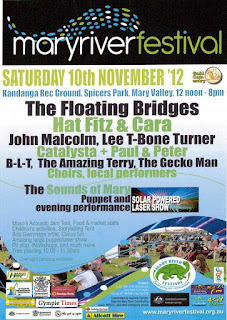 A full day of music and entertainment along with a film tent, a local history tent, recycled instruments, heaps of information tents and stalls, an acoustic jam tent and the anticipated highlight of the Sounds of Mary performance and light show early in the evening. So much fun and excitement for everyone along with stacks of children's activities and the opportunity to be involved in the twilight performance. 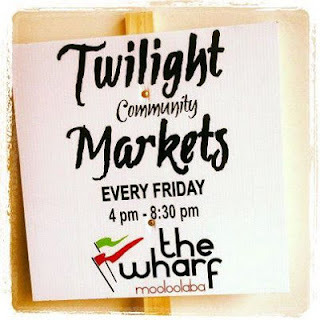 Twilight Community Markets will be running every Friday throughout the holiday period (end Feb) providing great family entertainment on a Friday night to both locals and holiday makers in Mooloolaba and surrounding areas. Twilight Community Markets are more then just a market, but a fun experience for the whole family. 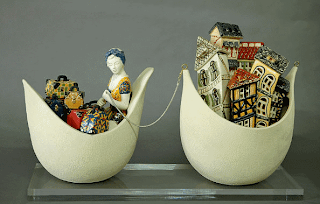 Browse the many stalls and shops full of interesting crafts and gifts with great entertainment for the children. Enjoy a meal or a light snack from one of the food outlets or fresh produce stalls while listening to a variety of musicians and buskers. The markets will be open from 4 - 8.30 pm. The Noosa Jazz Festival is an iconic Queensland music event, celebrating jazz of all genres, alternate pop and progressive music. Now into its 21st year, the festival is recognised as one of premier cultural events and one of Australia’s most popular jazz industry gatherings. 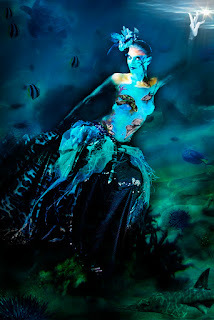 In 2012, the Noosa Jazz Festival will offer a stellar lineup of musicians from all genres of jazz music, from traditional to modern funk and blues, alternate pop and progressive. Headline acts include jazz great Grace Knight and Liam Burrows, who was recently announced Best Jazz Artist at the 2012 MusicOz Award. Check the program for the full artist schedule. 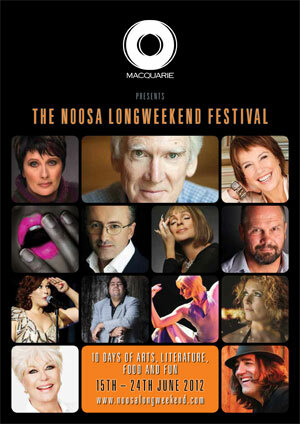 Enjoy four great days of music from 30 August to 2nd September 2012 at the Noosa Jazz Festival. There is something for everyone! Sunday 12 August 2012 at Russell Family Park, Maleny–Montville Road, Montville from 2–4 pm enjoy an afternoon of FREE music and entertainment from the 50’s, 60’s, 70’s and 80’s. BYO chair and picnic blanket (no glass). Every July, thousands descend on the Sunshine Coast hinterland town of Pomona for the annual King of the Mountain Festival - Home to Australia’s most grueling and historic mountain race, the Bendigo Bank International Mountain Challenge – a 4.5km race up Mount Cooroora and back – it attracts competitors from all over the world. This year, at the 33rd event held on July 22, 2012, current record holder and winner of the Bendigo Bank International Mountain Challenge six times in a row, Niel Labinsky is going for the most consecutive wins in King of the Mountain history. Also this year, there is a new event for high school competitors – the Zinc 96.1FM Mountain Dash – a 2.4km run from the main race starting point to the base of Cooroora Mountain and back. The Pomona King of the Mountain Festival is a free fun day out for the whole family with market stalls, food, entertainment, live music, rides and much, much more. The festival kicks off at 7am and ends at 5pm. Queensland Garden Expo (from 6 - 9 July) is a three day celebration of gardening. The event attracts over 28,000 green thumbs and novice gardeners from across Queensland and interstate. Held at Nambour on the beautiful Sunshine Coast, it is ideally situated to showcase all the best of subtropical gardening. An extensive Lecture and Demonstration Program, Landscape Feature Gardens, over 360 exhibits including 60 nurseries and the Giant Kitchen Garden Feature are just a few of the things visitors can enjoy at the Expo. Great food, entertainment and a range of free children’s activities all combine to make Queensland Garden Expo a great day out. The Sunshine Coast Literary Association is a not-for-profit association dedicated to nurturing, showcasing and celebrating literary talent throughout the Sunshine Coast region. The Sunshine Coast Literary Association received an overwhelming response to the 2012 Writers’ Competition, with entries flooding in from across South East Queensland. Category 1: Open Short Story, to a maximum of 2500 words. Category 2: Open Poem, to a maximum of 40 lines. Category 3: Young Adult (High School, Years 8-12) Short Story, to a maximum of 1500 words. Category 4: Young Adult (High School, Years 8-12) Poem, to a maximum of 30 lines. Category 5: Junior (Primary, Years 5-7) Short Story, to a maximum of 1000 words. 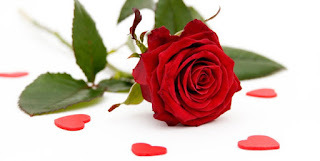 Category 6: Junior (Primary, Years 5-7) Poem, to a maximum of 20 lines. A panel of experienced judges will decides on the winners, which will be announced at the SCLA Writers’ Competition Awards Dinner on Thursday, 21 June at 4th Floor Restaurant in Mooloolaba. Due to swimming pool upgrade during month of May we are doing deals. Get 50% off for all stays of 3 nights or more* during month of May. 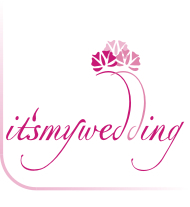 Call (07) 5444 1844, email or enquire on our website. * Conditions apply. Subject to availability. Whether you're a competitive swimmer or a weekend warrior, the Kings of the Coast Ocean Swim Festival is your chance to conquer iconic open water distances in one big weekend of surf, sand and swimming in Caloundra. The Festival begins with the new 1500 metre Olympic Relay - a solo, pairs and teams event that promises action a-plenty for both swimmers and spectators alike. Following the Relay, a free 300 metre Kidz Dash will also be held. On Sunday, test your mettle in the ultimate open water challenge - a 3.8 kilometre ironman distance swim from Moffat Beach to Kings Beach. If you competed as part of a team in Saturday's Olympic Relay, step up in distance and set your sights on Sunday's one kilometre Short Course at Kings Beach. No matter what your swimming ability, your next challenge awaits at the Kings of the Coast Ocean Swim Festival. 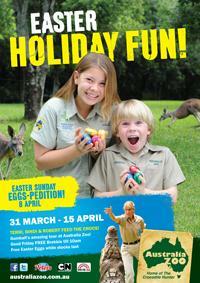 It's as WILD as School Holidays get at Australia Zoo and they've got more fun and games than you can poke a stick at! Visit during the school holidays for FREE face painting, a ripper colouring in competition plus you can enter the Major Prize Draw for you chance to win some awesome prizes! Watch Terri, Bindi, Robert and Wes feed awesome Croc in the world famous Crocoseum during 12.00/noon Wildlife Warriors show. Don't miss all the jaw snapping action! Place a bid in our Silent Auction for your chance to WIN a once-in-a-lifetime experience with the Irwin family! By helping raise much needed funds for the Australia Zoo Wildlife Hospital you could WIN an awesome animal encounter! And who best to have as your tour guide than the Irwin Family?! Have you ever wondered what it would be like to work as a Zoo Keeper? Well, wonder no more because the school holidays are back, and so is Australia Zoo's holiday program, Zoo Keeper for a Day! If you are aged between seven and twelve you can join the zoo crew to help feed the animals and clean enclosures, with exclusive behind the scenes access and plenty of hands on action. It's a day you won't forget! Places are limited so bookings are essential. ** Dates subject to change. May not occur on every day throughout this period. At 8.30pm on Saturday 31 March, Earth Hour 2012 will see hundreds of millions of people around the world cross borders of race, religion, culture, geography and society to unite in a single moment of contemplation for the planet and celebration of their year-round commitment to protect it. HOW: Switch off your lights. The Queensland Air Museum at Caloundra, presents the Aero Engine Run Day on 31st March, with a special display of aviation horsepower. The museum will be firing up its collection of historic operational aircraft engines and aircraft. The awesome sight and sound of a 1500 horsepower 14 cylinder radial engine powering up an unforgettable experience and one that you wouldn't want to miss. 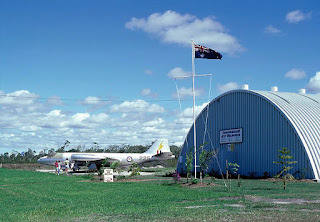 The regular museum display of over 50 aircraft and aviation memorabilia is included in the entry fee. An all day barbecue Sausage Sizzle will be operating with cold drinks, tea and coffee. Leaping leprechauns! It's as wild as St Patrick's Day gets as Australia Zoo GOES GREEN to celebrate on 17 March. Thanks to Nestle Peters, you could win enouch ice-cream for 365 days for you and your family! 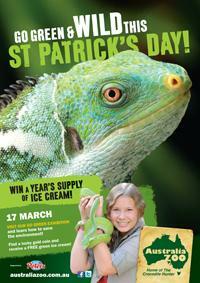 Visit Australia Zoo on St Patrick's Day and go in the Major Prize Draw. Throughout the day there will be heaps of super cool activities, face painting and games. Find one of hidden lucky coins around the Zoo and win a yummy green ice-cream from BW's ice creamery! Identify the whereabouts of ten Australia Zoo plant species and go in the draw to win a ripper Australia Zoo prize pack. You might even spot lucky leprechauns roving around the Zoo! Crikey! So don't be green with envy, be green at Australia Zoo this St Patrick's Day! The Noosa Festival of Surfing is a week long family event that incorporates amateur and Pro longboard surfing plus a range of other surfing disciplines, including Stand Up Paddle, Tandem and Finless. Three pro specialty events will offer a total of $7000 at the Noosa Festival of Surfing, presented by Global Surf Industries, March 11-17. The event also includes surf cultural entertainment for all ages. It is the largest surfing event in the world by competitor numbers. With Valentine's Day approaching why not surprise the loved one with Sailport Apartment Romantic Escape Special. 7 night Romantic Escape Special for 2 adults includes a bottle of bubbly on arrival and a romantic sunset cruise through the beautiful Mooloolaba River system and all that for $890. Swim it, Ride it, Run it, Tri it! 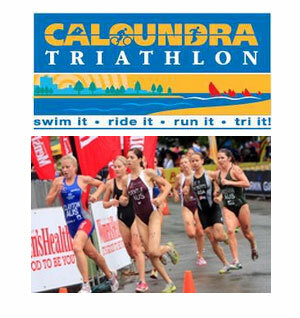 The Caloundra Triathlon forms part of the Gatorade Queensland Tri Series and offers two distances for competitors aged 13 to 80+ . and The Seven Sunshine Coast Enduro Triathlon will be included again featuring elite athletes. Celebrate A Summer Of Food, Flowers and Fun At The Ginger Factory from Friday 27th to Sunday 29th JANUARY 2012. Entry is FREE! The Ginger Factory will burst into bloom with the very first ginger flowers and heliconias for the season, to be unveiled at the Ginger Flower & Food Festival. Coupled with the gorgeous showcase of over 120 varieties of exotic plants will be a top line-up of chefs, gardening celebrities and a very special outdoor patio display that one lucky visitor will win – complete with outdoor furnishings, landscaping and a seriously impressive multi-burner barbecue. The festival will also unveil a completely revamped cooking format with chefs preparing beautiful dishes themed around barbecues, picnics and cocktails and canapés. This three day Festival is a true celebration of Queensland’s sub-tropical lifestyle and will be filled with loads of entertainment, glorious food and of course…flowers! 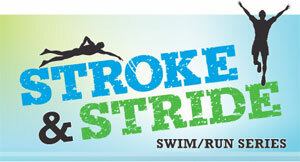 Now in its second year on the Sunshine Coast the Stroke and Stride Series is fast becoming an event for all to do. Whether its for the seasoned athletes honing thier preperations for up coming events, those first timers giving it a go or for the future champions with the kids events there is something for everyone to enjoy at the Stroke and Stride Series. 1st, 2nd & 3rd for each age group will be recognised on the day and every entrant then goes into the draw for some amazing prizes which include, Brooks running shoes, Maui Jim sunglasses, SUGOI active wear, compression gear from Allez Sport, Nathan Sports Gear, Apollo cycling gear and much more. But you need to be present on the day, so make sure you stick around to see if you are one of the lucky winners. Make sure you get to the event on Saturday 26th January 2012 with enough time to register (we suggest at least an hour before), set up in transition, warm up and then be present at the race briefing 15 minutes before the start of the first race, which is 9am. 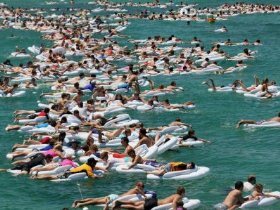 The Havaianas Australia Day Thong Challenge will once again be held in 2012 where thousands of Aussies will hit the beach to flog their neighbouring States in the seventh Annual Havaianas Thong Challenge World Record attempt. Bring your friends, family and your spirit of competition along to the Havaianas Thong Challenge at Mooloolaba Beach. Be a part of a sandsational day of flip-flopping around in the water, lapping up the beautiful Australian sunshine. Be involved in Australia's most iconic summer event and help attempt to break a world record! There will be plenty of fun activities and events off the water as well - please visit the web site for further details. As part of the registration, participants receive a Giant Inflatable Havaianas Thong (valued at AUD49.95).